If the pen is mightier than the sword, why not use it in armed conflict? The 1983 role-playing game Mission: Mainframe certainly tried to. Mission: Mainframe substitutes BICs for battleaxes, bringing the venerated dungeon crawler structure out of the catacombs and into an office park. Beneath the enjoyably atypical setting, this is a standard if slipshod RPG, and its surface-level changes to the genre formula are its most jarring. Those accustomed to swords and sorcery will pick it up quickly, but they might have trouble adapting to its confusing new lexicon. 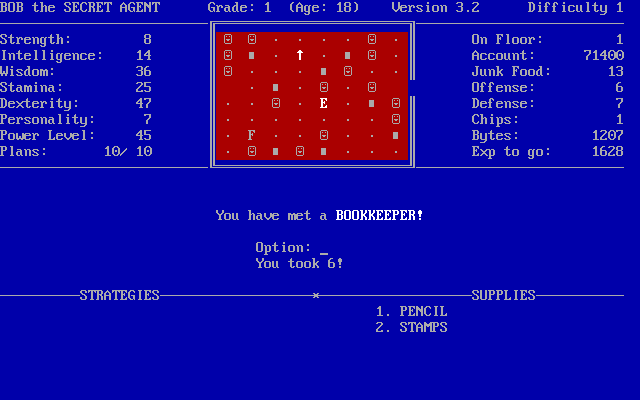 The game throws players into a lightly dystopian office building where a malfunctioning central computer has turned work life into a totalitarian nightmare. You can save the resident company by finding the the mainframe and reporting it to IT. Success does not come easily: you’ll need to stockpile supplies, deal with office belligerents, and gain clearance to ascend to the upper levels of the building. 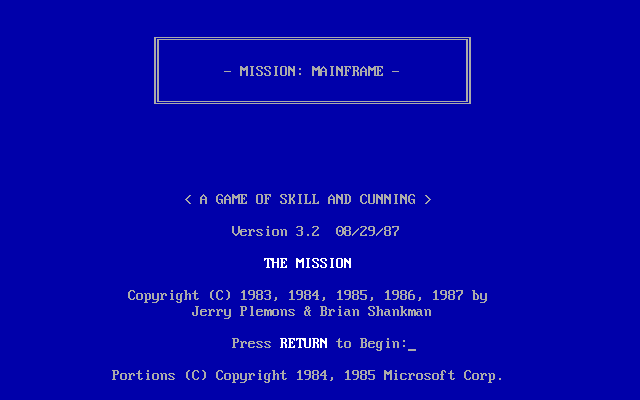 In contrast to nearly every other role-playing game (especially at the time), Mission: Mainframe has no elements resembling science fiction or fantasy. 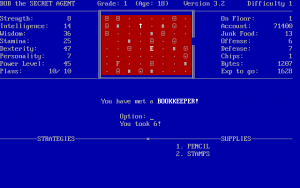 You’re fighting records clerks with pencils and file folders, like a lower-stakes version of The Crimson Permanent Assurance. Well, not only fighting. Many of your encounters with office drones will end in compromise or trickery, depending on your skillset. Similarly to any dungeon crawler, you have a variety of skills and spells at your disposal, like flattering employees or distracting them with phone calls. Certain enemies have their own powers and can steal your supplies or warp you across the floor. You’ll also find yourself juggling, effectively, three types of currency. Mission: Mainframe has many moving parts, but the game thankfully includes an exquisite in-game manual explaining all its mechanics. This allays much of the complexity. Mission: Mainframe still confuses more than other RPGs, in part because of its total removal of fantastical elements. The game still includes magic spells that cost magic points to cast, but here, they’re “strategies” that use “plans.” Clever and unique though that may be, you have to relearn basic terms to play. Consciously avoiding common genre vocabulary gives the game a unique sheen at the expense of comprehension. Sporadic glitches that affect the in-game map and stat generation frustrate as well. But even without those inconveniences, this game is ruthless. I played Mission: Mainframe with no intention to win and enjoyed myself accordingly, but my characters rarely lasted more than a few minutes. You need a special keycard to advance above the tenth floor, and I never came close to finding it. Opaque mechanics are partly responsible for this, like the “Deal” command that allows you to bribe enemies for their compliance but never hints how much you should offer them. For the most part, it’s just a punishingly hard dungeon crawler where advancements depends on finding a random item. I cannot imagine much enjoyment in seriously attempting to beat it. There’s that mental image, though, of fighting off an accountant with a fistful of paperclips. A traditional fantasy-inspired roguelike with the aforementioned faults and difficulty imbalance would be unbearable, but the unusual thematic veneer disguises those problems. This is still a junky game, of course, but one at least mildly fun to try since it plays like an especially violent Dilbert strip. The odd combination of setup and style is Mission: Mainframe‘s lifeline as well as its biggest hurdle. Office mayhem is amusing, but departing from standard genre language obscures the game’s playability. The good parts prove that a great white-collar role-playing game could exist, but for coherence, it would need to invent new underlying gameplay concepts instead of tweaking existing systems. Mission: Mainframe appears to have been continually developed throughout the 1980s. This article is based on Version 3.2, released in 1987 and given five copyright dates. I’m not sure how I came by this game, but I played it a lot when I was in my early twenties–yes, I’m really dating myself now. 🙂 Anyway, I enjoyed it very much even though I never won the thing. I tried multiple times, but either the power would go out or I’d encounter an office employee I couldn’t get past. It was still a lot of fun though, and I admire the author’s creativity.